ifty-eight million Americans are still exposed to secondhand smoke, according to a new report from the Centers of Disease Control and Prevention. (NEW YORK) — Fifty-eight million Americans are still exposed to secondhand smoke, according to a new report from the Centers of Disease Control and Prevention. It’s a proven danger, and exposure rates have been plummeting over the years — until now. In 1988, 87 percent of people were exposed to secondhand smoke; in 2011 it was only 25 percent. But according to the CDC’s Morbidity and Mortality Weekly Report, progress has stalled in recent years. Worse, exposure remains dis proportionally high for some groups: 38 percent of children ages 3 to 11, 48 percent of people living below the poverty line, 73 percent of people living with a smoker, and 30 percent of people without a high school diploma. These new figures are based on the National Health and Nutrition Examination Survey (NHANES), a study designed to evaluate the overall health of Americans. Researchers conducted home interviews and took laboratory samples, looking for serum cotinine — an indicator of recent nicotine exposure, the highly addictive chemical found in cigarettes. Secondhand smoke is cigarette smoke inhaled by someone who isn’t smoking. A combination of smoke from a burning cigarette and the smoke exhaled by smokers, it contains more than 7,000 chemicals. Hundreds of these are toxic and at least 70 are known to cause cancer. Not only does tobacco use claim 6 million lives per year among users, secondhand smoke has been responsible for at least 2.5 million deaths in nonsmokers since 1964. There is no acceptable level of secondhand smoke. 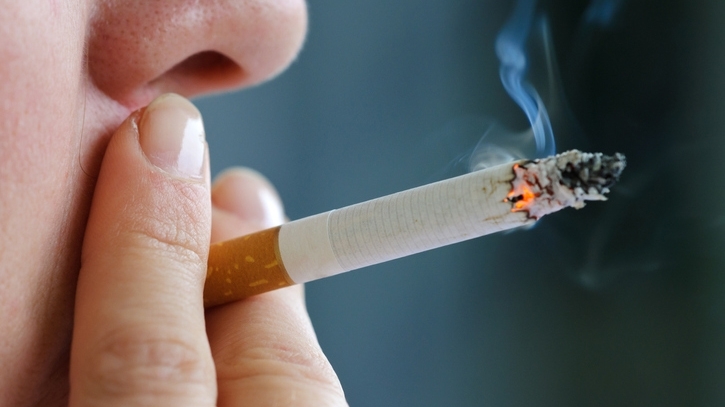 Exposure to secondhand smoke has been associated with countless health problems. Aside from raising the risk for asthma, respiratory infections, and sudden infant death syndrome, it can even raise the risk of heart disease and stroke by almost 30 percent, according to the CDC. In fact, even brief contact can irritate and damage blood vessels. Secondhand smoke also increases the risk of lung cancer by 20 to 30 percent; even if they didn’t light the cigarette, people nearby are breathing in some of the same toxic chemicals. While we did see an almost 70 percent decline since 1988, progress has stalled, and 1 in 4 nonsmokers are still exposed to significant amounts of secondhand smoke. The CDC says the slow adoption of legal smoke free areas could, ironically, be to blame. So far, 27 states and the District of Columbia have passed smoke-free laws, but the implementation of such laws is slowing down. The U.S. Department of Housing and Urban Development also has plans that will require most public housing to be smoke-free by July 31, 2018. The CDC is recommending further implementation of “smoke-free” policies in work and public places. The public should take particular notice of the people who may be affected most by secondhand smoke — 38 percent of children between the ages of 3 to 11. “These findings reveal that there is still much more to do to protect everyone — especially children –from this completely preventable health hazard,” said CDC Director Robert R. Redfield in a press release. Sumir Shah, M.D. is an emergency medicine physician in New York City, and a member of the ABC News Medical Unit.